If you are like me you have struggled to accept the modern Christian church’s portrayal (or betrayal) of God, depiction of the devil and description of hell. Many god-fearing people and good-hearted preachers alike have long harbored unspoken thoughts of a more loving, merciful and masterful Creator. However, just about as many who subscribe to this grander vision and version of God also admittedly and even ashamedly lack the ability to reference the Bible and specific passages of scripture in order to publicly validate these privately held higher concepts of God. If you are looking for chapter and verse that will both quickly and completely rescue a big God from the smallness of fundamentalism,THE HOLY BIBLE OF INCLUSION is precisely the tool you need! In his book, THE HOLY BIBLE OF INCLUSION, Pastor D. E. Paulk does a much more thorough and comprehensive job of probing the critical concepts of Inclusion than I do in my book, THE GOSPEL OF INCLUSION. The delicate theological, scriptural and spiritual balance my friend D. E. Paulk walks and writes in this book, is an artistic, tactful and tasteful treatment of some of the most sensitive aspects of both modern and ancient religious doctrine, dogma and discipline. The subject of Inclusion deals more with being and feeling spiritually and mentally safe than being and feeling religiously saved. I am proud of the expanded consciousness this book embraces and embarks upon in further discussion. During this journey you will inevitably enjoy renewing and re-knowing God (and yourself) all over again - or perhaps for the first time. Peace is possible. “All Scripture is given by inspiration, and is profitable for doctrine...” In THE HOLY BIBLE OF INCLUSION, Pastor D.E. Paulk proves himself as a man inspired to be both iconoclast and intermediary, provocateur and peacemaker. This fearless and daring work...this labor of love...will no doubt tear down walls, build bridges, and ultimately reveal the authentic heart of Christ to this and future generations. He or she who has an ear, let him hear! I speak a blessing upon you for setting your heart and intention to study the Word of God as captured and expressed in the Judeo- Christian scriptures, tradition, culture and mindset. Although eternal truth cannot be completely contained in, nor confined to, any singular book, concept or even religion, the purpose of this book specifically is to deal with and reveal the truth that is found and often times concealed in the Holy Bible. This book is designed to voice and uncover hidden biblical truths to the Christian mind. Allow me to say from the outset that I am at peace with me...and with you! My desire is not to try to prove my theology to be right and that of others to be wrong. If I have done so in the past, I have since learned that debate can be divisive, and the egoic need to be right can, in the end, unconsciously make you wrong. Furthermore, I cannot claim to be a “Oneness” teacher and be void of the realization that at the very heart of this idea is (and must be) tolerance and celebration for diversity of thought. After all, the Body is made whole by what every part supplies. Each one of our individual journeys is both sacred and spiritual. We all progress at our own pace. And, we all evolve in our own space. To be open and honest, my spiritual journey has led me to as many questions as it has to answers. Like King David, my earnest desire is to dwell in the presence of God and to INQUIRE of the Lord. All I ask is that we honor one another on our particular searches for truth and acknowledge that Truth is a Journey, not a Destination! And as it relates to me personally, all I ask is that you recognize my love for God, for truth, for God’s Word and for God’s people. It is improbable, and perhaps even impossible, for us all to be on the exact same page theologically. However, it is possible to value the Part I - Introduction, Goals, and Bible Origins perspective of others, and it is healthy to allow iron to sharpen iron. I respect your journey and growth. I hope that whatever your truth is, and is becoming, that you see my truth is living and moving and having its being in me - and as me. Let us be agreed that as we grow together in truth that we not confess our theology is changing – but rather that we recognize the fact that God is taking us from glory to glory! God has continuously revealed unchanging truth throughout the ages line upon line, precept upon precept. Eternal truth does not change over time but is revealed and embraced over time. Honestly, love is the only universal and timeless absolute that I have discovered thus far. 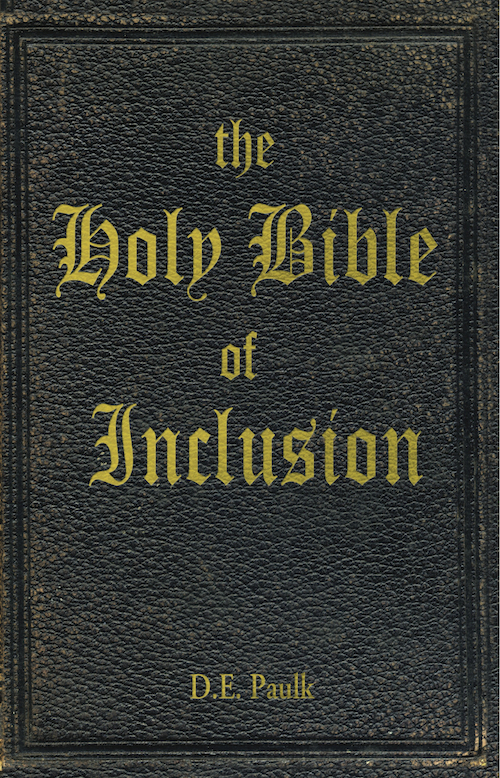 So to all who will read this HOLY BIBLE OF INCLUSION... I say “NAMASTE” – that which is holy in me recognizes that which is holy in you. My earnest prayer is that this book will reveal Christ TO us, IN us, THROUGH us and AS us. My mind is alert and my Spirit is open to receive Truth. I acknowledge that Truth is not reserved only to what I already know and is not merely restricted to concepts with which I am already familiar. As beauty is in the eye of the beholder – Truth is in the ear, heart and mind of the perceiver. Spirit of Truth, CARRY me where You will; BRING to me what You will; TAKE from me what You will...I am surrendered. Amen. 1) To promote the idea that GOD IS LOVE! If our study in the scriptures leads us to a better understanding of God’s love and to a more powerful expression of the love of God – this book will have accomplished its goal. Dear friends, let us love one another, for love comes from God. Everyone who loves has been born of God and knows God. Whoever does not love does not know God, because God is love. Whoever lives in love lives in God, and God in him. We will be equipped to effectively communicate to others that God is bigger than any idea of holding grudges, getting even or keeping a meticulous record of our sins. We will be prepared to show through our study of scripture that God is Creator, and is fully able to teach, discipline, purify, maintain and parent His Creation. 3) To reveal a STRONG, VICTORIOUS JESUS! We will be able to show a conquering Last Adam who is much more powerful and successful than the first Adam was...or ever could be. We will become knowledgeable of the FINISHED WORK of God’s Grace through the atoning work of Jesus the Christ. For if, when we were God’s enemies, we were RECONCILED to him through the death of his Son, how much more, having BEEN RECONCILED, shall we be saved through his life! Not only is this so, but we also rejoice in God through our Lord Jesus Christ, through whom we have now RECEIVED RECONCILIATION. Consequently, just as the result of one trespass was condemnation for ALL MEN, so also the result of one act of righteousness was justification that brings life for ALL MEN. 4) To be EMPOWERED as LEADERS and EQUIPPED as TEACHERS for the WORK OF OUR MINISTRY! We will be ready to answer, TEACH and instruct others in the deep mysteries of the Love of God. And He Himself gave some to be apostles, some prophets, some evangelists, and some pastors and teachers, for the equipping of the saints for the work of ministry, for the edifying of the body of Christ, till we all come to the unity of the faith and of the knowledge of the Son of God, to a perfect man, to the measure of the stature of the fullness of Christ; that we should no longer be children, tossed to and fro and carried about with every wind of doctrine, by the trickery of men, in the cunning craftiness of deceitful plotting, but, speaking the truth in love, may grow up in all things into Him who is the head - Christ - from whom the whole body, joined and knit together by what every joint supplies, according to the effective working by which every part does its share, causes growth of the body for the edifying of itself in love. We are all LEADERS in some capacity and are being further prepared to LEAD. Consider these definitions of leadership as we accept the responsibility to LEAD others into truth. One who leads and guides by means of influence or by way of power. One who can direct people toward the achievement of a goal. One who is not afraid to jeopardize himself, or those around him, to achieve a result that will be for the betterment of the corporate good. As we embark on this journey toward deeper biblical understanding, I call to the leader that resides in you...you’re going to need it.